On Sunday, July 3/16, 2017, exactly 100 years since Hieromonk Mardarije (Uskokovic) was sent to the United States in order to assist with the Serbian Orthodox Mission of the Russian Orthodox Church in North America, His Holiness Serbian Patriarch Irinej led the Glorification and Translation of the Relics of St. Mardarije of Libertyville and All-America. With the blessing of His Grace Bishop Longin of New Gracanica and Midwestern America, the festivities began on Friday, July 14, with a Symposium dedicated to the Life and Times of St. Mardarije at Holy Resurrection Serbian Orthodox Cathedral, with lectures delivered by Dr. Srdja Trifkovic, Dr. Nicholas Groves and Dr. Nicholas Ganson. Before the beginning of Vespers, His Holiness Patriarch Irinej arrived at the Cathedral and was greeted with a Doxology Service in order to give thanks to God for the safe arrival to Chicagoland of the Spiritual Leader of the Serbian Orthodox People. Following the Doxology Service, Vespers was served, after which His Grace Bishop Longin welcomed His Holiness to the Diocese of New Gracanica and Midwestern America and asked for his fatherly blessing. His Holiness then participated in a Press Conference for news agencies regarding the Glorification of the newly-revealed Saint. A documentary film, sponsored by Ostrog Monastery in Montenegro called “The Quiet Corner of Christ,” was presented. This inspirational film focused on the life and struggles of St. Mardarije. The hall was filled to capacity and everyone was most eager to witness the film's premiere. Hereupon, His Eminence Metropolitan Amfilohije of Montenegro and the Coastlands gave a beautiful talk on the life of St. Mardarije and what he meant to the world during his lifetime and his prophetic witness for us today and the future. On Saturday, July 15, His Holiness Patriarch Irinej served Patriarchal Divine Liturgy at New Gracanica Monastery in Third Lake, Illinois, concelebrating with is Grace Bishop Longin of New Gracanica and Midwestern America (the host-Bishop), His Grace Bishop Anthony of Toledo and the Midwest (Antiochian Orthodox Church), His Eminence Arhcbishop Nikodim of Northern Donetsk and Starobeljski (Ukrainian Orthodox Church of the Moscow Patriarchate), His Eminence Metropolitan Amfilohije of Montenegro and the Coastlands, His Eminence Archbishop Peter of Chicago and Mid-America (Russian Orthodox Church Outside of Russia - Moscow Patriarchate), His Grace Bishop Theodosy of Seattle (Russian Orthodox Church Outside of Russia - Moscow Patriarchate), His Grace Bishop Mitrofan of Canada, His Grace Bishop Maxim of Western America, and His Grace Bishop Irinej of Eastern America. The Episcopal Choir of the Diocese of New Gracanica and Midwestern America responded at the Divine Liturgy, under the guidance of Marya Milicich. The church was overflowing with faithful who had come from all parts of North America in order to venerate the relics of St. Mardarije. At the end of the Liturgy, Bishop Longin welcomed Patriarch Irinej to New Gracanica Monastery, a place he has visited many times, especially during the lifetime of Patriarch Pavle of Blessed Memory, and offered a festive meal in the Monastery Hall. 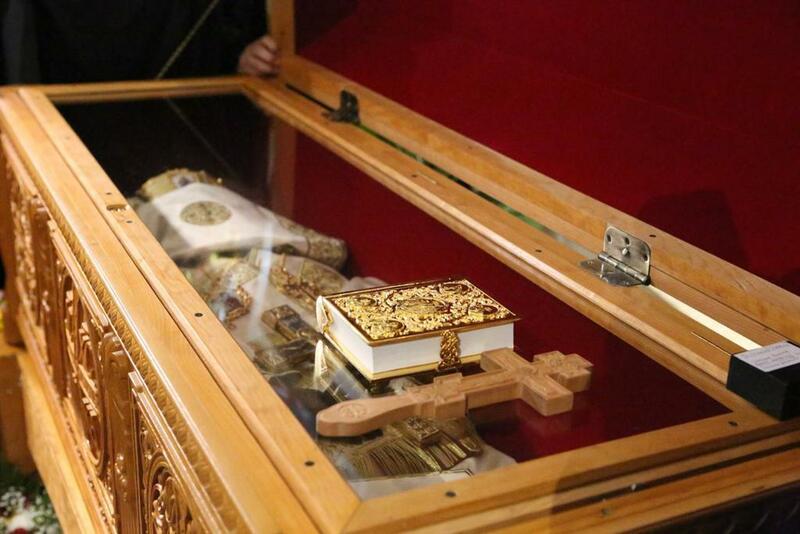 That evening, nearly a thousand faithful awaited the arrival His Holiness to the All-Night Vigil at St. Sava Monastery, where the incorrupt relics of St. Mardarije were resting in a closed reliquary. The faithful came from all over America and Canada in order to venerate these holy relics. At the doors of the church, His Holiness was greeted by several hierarchs, including His Beatitude Metropolitan Tikhon, Primate of the Orthodox Church in America. The service was sung by the St. Vladimir Russian Orthodox Male Choir from New York City, under the direction of Director Adrian Fekula. For some sticheras, especially those dedicated to St. Mardarije, a choir of clergy sang from the pjevnica (kliros), led by His Grace Bishop Mitrofan of Canada. With joy, people eagerly anticipated the opening of the reliquary at the Magnification (Polyeley) of St. Mardarije. The newly revealed relics brought peace over the Monastery, and the spiritual joy experienced by all in witnessing this miracle of God is indescribable. Following Vigil, a meal was offered at New Gracanica Monastery for the faithful. On Sunday, July 16, at the gates of St. Sava Monastery, built by St. Mardarije himself, His Holiness Patriarch Irinej was greeted by all the serving hierarchs and clergy. Among the hierarchs were: His Beatitude Metropolitan Tikhon of America and Canada (Orthodox Church in America), His Grace Bishop Dimitrios of Mokissos (Greek Orthodox Archdiocese of America), His Grace Bishop Anthony of Toledo and the Midwest (Antiochian Orthodox Church), His Eminence Archbishop Nikodim of Northern Donetsk and Starobeljski (Ukrainian Orthodox Church of the Moscow Patriarchate), His Eminence Metropolitan Amfilohije of Montenegro and the Coastlands, His Eminence Sava, Metropolitan of America (Georgian Orthodox Church), His Eminence Nicolae, Archbishop of the Americas (Romanian Orthodox Church), His Eminence Archbishop Peter of Chicago and Mid-America (Russian Orthodox Church Outside of Russia - Moscow Patriarchate), His Grace Bishop Paul of Chicago and the Midwest (Orthodox Church in America), His Grace Bishop Theodosy (Russian Orthodox Church Outside of Russia - Moscow Patriarchate), His Grace Bishop Longin of New Gracanica and Midwestern America (the host-Bishop), His Grace Bishop Mitrofan of Canada, His Grace Bishop Maxim of Western America, His Grace Bishop Irinej of Eastern America, His Grace Bishop Kirilo of Diokleia and His Grace Bishop Sava. Among the clergy, which comprised all those who serve in the Diocese of New Gracanica and Midwestern America as well as many guests from the other Dioceses in North America, were honored guest clergy: V. Rev. Archimandrite Tomas (Kazich), Spiritual Father of New Gracanica Monastery; V. Rev. Stavrophor Marko Todorovich, Hierarchical Deputy of the Diocese of New Gracanica and Midwestern America, V. Rev. Archimandrite Nectarios (Harding) of Holy Trinity Russian Orthodox Monastery in Jordanville, New York; V. Rev. Abbot Damascene (Christensen) of St. Herman of Alaska Serbian Orthodox Monastery in Platina, California; Rev. Hieromonk Ignatij (Shestakov), Editor-in-Chief of Pravoslavie.ru and Sretensky Russian Orthodox Monastery in Moscow, Russia; V. Rev. Stavrophor Obren Jovanovic, Secretary of the Metropolitanate of Montenegro; V. Rev. Protosindjel Vasilije (Gavrilovic) of Holy Transfiguration Monastery in Milton, Ontario, Canada; V. Rev. Stavrophor Nikola Ceko, Hierarchical Deputy of the Western Diocese; V. Rev. Stavrophor Dr. Zivojin Jakovljevic, Hierarchical Deputy of the Eastern Diocese; Patriarchal Protodeacon Dr. Damjan Bozic, Editor-in-Chief of the Official Organ of the Serbian Orthodox Church “Pravoslavlje” (“Orthodoxy”) and “Teoloski Pogledi” (“Theological Views”); and, Protodeacon Slobodan Vujasinovic, Diocesan Deacon of the Diocese of Srem. Along with the hierarchs and clergy, over one hundred children gathered to greet the Patriarch, dressed in traditional Serbian folk costumes. The procession led from the gates of the Monastery to the Relics of St. Mardarije, which had been placed in the middle of a huge tent, erected for the Divine Liturgy, served directly in front of the Monastery Church. Among dignitaries present at the Divine Liturgy were Prime Minister of the Republic of Srpska, Her Excellency Ms. Zeljka Cvijanovic and representative of the President of the Republic of Serbia, Mr. Vladimir Bozovic. After the vesting of the Patriarch, His Grace Bishop Maxim of Western America, on behalf of his Diocese, presented Bishop Longin with Holy Relics and an Icon of St. Sebastian of Jackson. These were placed on the reliquary of St. Mardarije to show their spiritual unity in building up the Serbian Orthodox Church in America and Canada. The responses at the Divine Liturgy were sung by a Pan-Orthodox choir, comprised of singers from parishes of the Diocese of New Gracanica and Midwestern America, as well as other Orthodox Churches in Chicagoland, under the direction of Dr. Peter Jermihov. After the reading of the Gospel, His Eminence Metropolitan Amfilohije read the 21st Archpastoral Epistle of St. Mardarije to his flock on Pascha 1935 (see below), which was translated by Bishop Iriniej of Eastern America. Following the epistle, Metropolitan Amfilohije presented to St. Sava Monastery a cross made from stone that was used to build the house where St. Mardarije was born in Kornet, Montenegro. Following the communion of the faithful from five chalices, a procession was made around the Monastery with the Holy Incorrupt Relics of St. Mardarije. During the procession, the blessing of the ground-breaking for the new addition to the Monastery Building which is being renovated was served on the place where monastic quarters will be built. After the blessing, the procession continued back to the tent, where the Slava Kolac was blessed and a prayer to St. Mardarije was read by His Beatitude Metropolitan Tikhon. His Holiness greeted the many hierarchs, clergy and faithful present, estimated to have been a crowd of over 4,000 people, with his Patriarchal message. After the Divine Liturgy, all the guests were invited to New Gracanica Monastery, where a banquet was held in honor of the Glorification. The original banquet was scheduled to take place on the property of St. Sava Monastery on the other side of the Des Plaines River, which had flooded the previous week. As a result thereof, that section of the monastery grounds were not accessible. At the banquet, His Grace Bishop Longin addressed those in attendance, thanking all the organizers for their help in preparing such a massive event for our Diocese. He also thanked those parishes and individuals who were significant donors. During the festivities, His Holiness Patriarch Irinej and His Beatitude Metropolitan Tikhon were honored with Order of St. Mardarije (I Degree). Musical and oratorical performances also took place during the celebration, including the singing of the national anthems of the United States, Canada, Serbia and Imperial Russia, as well as performances of Russian Folk Songs by the St. Vladimir Russian Orthodox Male Choir, the Pan-Serbian Choir and the Clergy Choir of the Diocese of New Gracanica and Midwestern America. After the program, His Holiness greeted all the faithful again, giving thanks to God for our newly-revealed Saint and blessed all those who gathered in his honor. Our people say that man learns as long as he lives. There is no greater teacher than personal experience. It is the most convincing teacher in life. How can you believe the cries of a hungry man if you yourself have never been hungry? How can you understand the cries and sighs of the sick if you have never been sick yourself? And here I, your bishop, send this epistle to you, my spiritual flock, scattered all over the great America, in my new and rich experience, gained in suffering, pain, and ceaseless sighing over the last two years, wanting to tell you everything that is in my heart, as if in confession, to tell you about that which has filled my being with a faith even stronger than the one which was planted in my heart from my childhood. Confessing before you, I want just one thing, and that is to strengthen you in your faith in God, Who was, is, and will be, regardless of whether people believe in Him or not. This is my confession. Lord Christ and my God, I don’t care if I die. I am not sorry to leave this world. I am ready to close my tired eyes and stand before Your righteous judgement seat, trusting that Your fatherly love and mercy will forgive me if in my earthly life I did not act according to Your commandments, if I was not zealous enough in the great and responsible episcopal mission, which You through Your Church entrusted me with. You will forgive me, I know, because Your fatherly love is beyond measure. You will also forgive me because, from my childhood, from the sixteenth year of my life, I dedicated my life to serving You, Your altar, and Your people. I am not afraid of death. Personally, I am even looking forward to it, because in Your eternal Kingdom, things will be incomparably easier for me than they have been in this sinful world. For me, the transition from this life is not a transition into an unknown, desolate space with no substance or sense, but a transition into Your eternal Kingdom, which You promised to all those who believe in You. But I beg of You, Heavenly Father and Lord Christ, pour out upon me, Your faithful servant, Your rich mercy, and leave me in this world a few more years, so that I can complete my service to my people and Church, in which You have mercifully elevated me to the greatest apostolic dignity. I would like to preach Your Holy Gospel with even more fervor, to even more warmly relate to my people that salvation is possible only through You and in You. Leave me on earth a little more that I may decorate the monastery of Your great saint Sava a little better. Extend the days and years of my life, if nothing else, then that I may help my old parent and his numerous family, whom a handful of people of no conscience, of irresponsible people from the street, cloaked with a cover of modern morals, try to bring down to the level of a pauper, destroying the community of his home. I pray to You, O Lord my God, fulfill my prayer. Hear me in my weakness, in this night and this hour of death. You can do anything. You brought back the dead from the grave to life with one word. With the touch of the fingers, You gave eyesight back to the blind. I pray to You, this night, when I expect my departure from this world, touch my weak body with Your miraculous right hand and return life to me, which is now on its way to being extinguished. O, Lord, let me get up from my death bed and return to my dear people, and preach to them how You worked a miracle on me and gave me back my life. But not my will be done, rather Your will be done, O Lord. Soon it dawned. They woke me up. Through the open doors of my room, a fully vested priest with a chalice in his hand entered. There could have been no Confession, because I could not speak. With tears of joy, I received the Body and the Blood of Christ for the last time, and with firm faith in eternal life beyond the grave, with faith which had never before been so illumined by the graceful presence of the kindest and most merciful, all-forgiving, heavenly Father and our Lord Jesus Christ, I partook of His Holy and most pure Body and Blood. Since then, two years have passed, my dear brethren, and I, by the Grace of God, have advanced in my health, so that today, the doctors and all people who have known me over the past eighteen years here in America tell me that I have never in my life looked better than right now. The content of my Paschal epistle for this year is unusual, my dearly beloved ones, but so is the event which I am relating to you. May God grant it that many derive a spiritual benefit from this confession of mine. It testifies that God to this day works miracles and fulfills the prayers of those who believe in Him. Therefore, my dear brethren, pray to God all the days of your lives and God will give you help in need as He approached me. And as for me, I will dedicate my extended lifetime on earth even more, from now on, to the service of God and my dear people, declaring even more convincingly that our salvation is in the Lord. And if we die, we will resurrect in Him. St. Mardarije was born as Ivan Uskokovic on November 2/15, 1889, to pious parents Pero and Jela (nee Bozovic). Pero was chief of the Uskokovic tribe from the Ljesani area of Montenegro. Ivan grew up with a great love for God and his Serbian people from Montenegro, but also for Slavic people in general. This brought a desire in him to serve his fellow man, but more importantly to serve God, prompting him to become a monastic at a very young age. By the time he was 15, he had already moved to Serbia where he was tonsured a monk and ordained a hierodeacon at Studenica Monastery by the hands of Bishop Sava of Zica. Not long after, he was sent to Imperial Russia, where he studied in the Seminaries of Zhitomir and Kishinev, successfully completing his studies. While in Russia, he was ordained a hieromonk at the age of 18. During this period, his love for the Slavic idea grew. It was his fervent desire that the Slavic people always would always remain firm in their commitment to Christ and traditional values. In 1912, he began studies at the St. Petersburg Theological Academy, which he completed in 1916, continually teaching and preaching to the Russian people. A book of these sermons was published in 1914. He was a gifted orator with a golden tongue, able to exegete on the most difficult of subjects in ways that were clear both to a great theologian or a lay person. On July 3/16, 1917, Fr. Mardarije was sent by order of the Holy Synod of the Russian Orthodox Church to serve in the Serbian Ecclesiastical Mission of the Russian Orthodox Diocese of America. Within several months, he was elevated to the rank of archimandrite and appointed Chief of the Serbian Ecclesiastical Mission. He immediately began his work in organizing church life and teaching the Serbian people about faith in Christ. Church congregations were organized, and he founded St. Sava Monastery in Libertyville, Illinois. After the Bolshevik Revolution and the fall of the Russian Empire, the Serbian Orthodox Church was granted permission by the Russian Orthodox Church Outside of Russia (the ruling body of all external affairs of the Russian Church outside the borders of Russia) to open a Diocese for America and Canada. Fr. Mardarije was elected to be the Bishop by the Holy Assembly of Bishops of the Serbian Orthodox Church and was consecrated on April 2/15, 1926, in the St. Archangel Michael Cathedral in Belgrade. Bishop Mardarije soon returned to the United States and intensified his work in the spiritual vineyard entrusted to him. Churches were consecrated and the construction of St. Sava Monastery was completed. All of his contemporaries spoke about him as a man of angelic life, exceptionally talented and with great vision. He was extremely humble, selfless and forgiving, especially of those who opposed his efforts, such as the building of the monastery and the seeking of order within the Church. Even many of the priests were hurtful to their Bishop, lacking respect for his efforts and desire to sacrifice for the good of Christ’s Church. During this time, he became very ill with tuberculosis. He suffered for a long time, often seeking treatments over a period of several months. He was literally crushed on the field of service to people and God. After much suffering and pain, Bishop Mardarije gave his noble soul to the Lord on November 29/December 12, 1935, while being treated at University Hospital in Ann Arbor, Michigan. His remains were transferred to St. Sava Monastery in Libertyville, where they were interred in the monastery church. The faithful Serbian people have always remembered the works of Bishop Mardarije, especially his direct participation in the physical building of the monastery. Remembering him in prayer, people have always come to light candles at his grave site. Because of this great remembrance of Bishop Mardarije, as well as the knowledge of the generations of hierarchs that came after him, attesting to his holy struggles and memory, and on the recommendation of the Episcopal Council of the Serbian Orthodox Church in North and South America, the Holy Assembly of Bishops of the Serbian Orthodox Church at its Regular Session held on May 16/29, 2015, added Bishop Mardarije to the Diptychs of Saints of the Serbian Orthodox Church. On April 22/May 5, 2017, with the blessing of Bishop Longin of New Gracanica and Midwestern America, the grave of St. Mardarije was opened, and his holy relics were revealed to be incorrupt. After being washed and anointed, they were placed in a reliquary and enthroned in St. Sava Monastery Church for veneration by the faithful people of God. On July 3/16, 2017, exactly 100 years from from the date when St. Mardarije was sent to the Serbian Orthodox people in North America, he was canonized at a Pan-Orthodox Glorification at St. Sava Monastery in Libertyville, Illinois, with His Holiness Serbian Patriarch Irinej leading the celebration along with representatives of the Local Orthodox Churches. Through the prayers of our father among the saints, Hierarch Mardarije, Bishop of America and Canada, Lord Jesus Christ, Son of God, have mercy on us and save us!